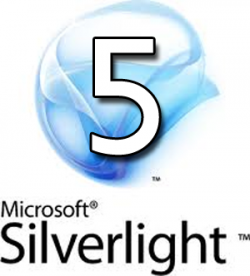 1- Most Silverlight 4 applications will work with Silverlight 5 without any changes. 2- When breaking changes are required, Silverlight will try to maintain support for the old behavior, as well as the new behavior, by using a quirks mode. Nevertheless, some changes made to Silverlight components can potentially cause your older Silverlight-based applications to fail (compile time, XAML load time, or possibly design time) or to behave differently. There are no known breaking changes between Silverlight 4 and Silverlight 5 in the Silverlight core runtime. Applications that were originally compiled using Silverlight 4 tools, and that continue to target the Silverlight 4 runtime, should work without issues on a client that has the Silverlight 5 runtime. To retarget an existing Silverlight 4 project for the Silverlight 5 runtime specifically, you should change the project targeting in Visual Studio, using the Silverlight Build Options / Target Silverlight Version section of the Visual Studio project configuration dialog. Then, recompile the project. The latest Silverlight templates are available in Silverlight Toolkit December 2011. This toolkit is the 9th release which is targeting the Silverlight 5’s new 3D features. Microsoft has delivered a new release candidate (RC) of Silverlight 5, a tool for creating and delivering rich Internet media and applications. C# 4 and C# 5 are still the most effective languages for writing the Silverlight 5 RC applications. Pete Brown, the leader of Microsoft’s Developer Guidance Community Team in September 2011, said the Silverlight 5 RC is now available as a developer-only release, and is preparing developers for the final release later this year. Silverlight 5 builds on the foundation of Silverlight 4 for building business applications and rich media experiences. Among other capabilities, the Silverlight 5 RC has modified video quality and performance, along with other features that improve developer productivity. These include reduced network latency by using a background thread for networking; XAML parser improvements that speed up start-up and run-time performance; support for 64-bit operating systems; and reduced network latency by using a background thread for networking. Does the Async CTP work with Silverlight 5 RC? The Async CTP may work with Silverlight 5 RC, but according to Microsoft’s Stephen Toub, works effectively with Slivelight 5 Beta. The recommended procedure is to up a system with Visual Studio 2010 SP1, and install Silverlight 5 Beta and the Async CTP. After all of these installations are completed successfully, you will be able to successfully create and run new SL5 projects that uses Async CTP.